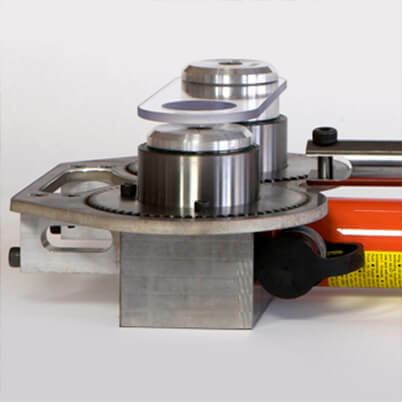 Wireteknik A200 portable roll swaging machine for wire sizes 1.6mm - 8mm. The A200 includes a hand pump. 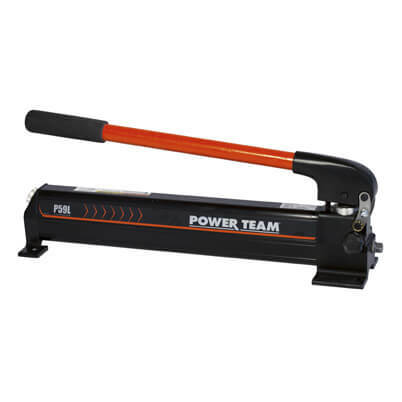 All machines include full sets of pullers. Note: Dies sold separately, Please contact us for full brochure. Fully approved by Lloyds Register of Shipping. 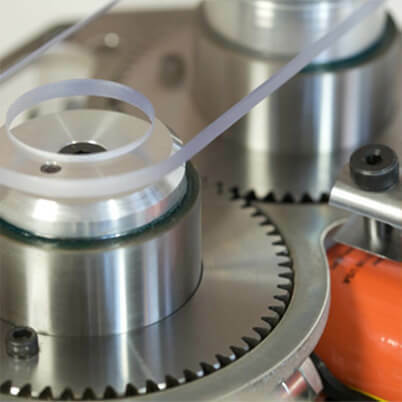 Swaging range: 1.6mm (1/16 in) to 8mm (5/16 in). Dimensions: L 500mm (19 3/4 in) x W 290mm (11 3/4 in) x H 140mm (5 1/2 in). Weight: 19.5 kg (43 lbs). Scenographic use at theaters for hanging and supporting set pieces. Extensively used for on-site swaging of wire fall protection systems on roofs and buildings. Structural rigging for hang gliders and ultra-light airplanes. Oceanographers uses it for swaging winch wire ropes for their surveying instruments. Lifting strops for fuel rods at nuclear power plants. Structural rigging for sail-roofs and sail-shades. Swaging speeds vary depending on type of cordless drilling machine. 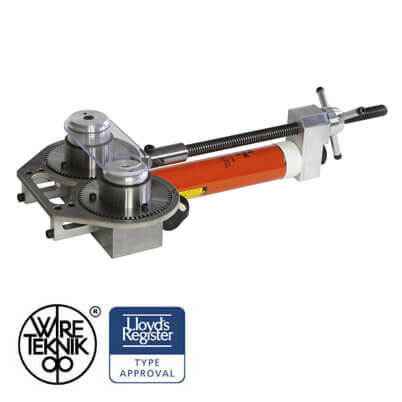 Typically a mid size machine with 1500 Rpm will give about 10 mm/second of swage-speed on a Wireteknik A200 Swager. Please contact our Sales and Technical Team for pricing and further information on 01302 752 504 or email us info@s3i.co.uk. 1. Choose the pair of roller dies that corresponds to the cable diameter, and slip them onto the cogwheel synchronizing pins. The arrows on the dies should always be in the swaging direction. 2. 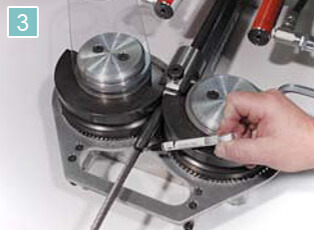 Attach the terminal to the attachment fixture on the drawbar, and adjust the length so the roller dies meet the terminal shank at desired position. 3. Apply just enough hydraulic pressure so that the roller dies holds the terminal firmly. Then mark and insert the cable into the bottom of the terminal throat. 4. Move the transparent protective shield into position. 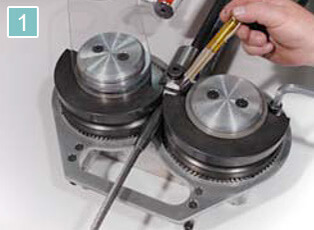 Apply hydraulic pressure to draw the terminal between the roller dies. 5. 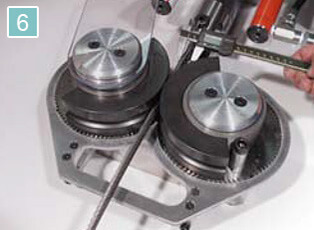 When the roller dies rotate, they will press the terminal shank onto the wire rope. 6. 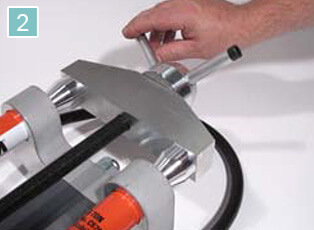 Measure the diameter of the terminal after swaging, and compare with the swage dimensions list. 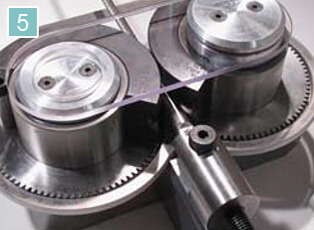 The swager is designed to reduce the terminal shank to required diameter in one pass. However dimension variations of terminals, cables or material hardness could make it necessary to pass the terminal twice. 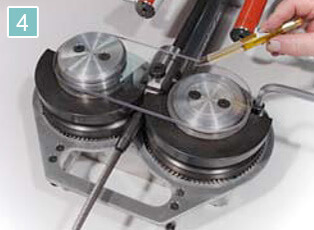 When swaging solid rods, a special swaging compound must be used. After swaging wipe off the roller dies and swaging machine, and apply a corrosion preventative.